Reinventing your business and managing its current state are “two fundamentally different management challenges.” Why? Tomorrow versus today inherently involves competition for resources (i.e., people, time and money) needed to do both jobs. Also, the rewards of the future are question marks while financial results show the rewards of the present. Box 1 — Maximize core-business efficiency by emphasizing “smarter, faster and cheaper.” At the same time, address near-term customer needs by introducing innovations that “extend the brand and/or improve product offerings.” Doing both allows people to explore the how of creating “new.” The exploration increases their comfort level with respect to making change happen, which promotes continuous improvement. Box 2 — Take a hard look at how you do business and question its relevancy in terms of where the business should be headed. While it can involve pruning businesses, it must also look at processes, practices, attitudes, etc., that thwart change. Some tough calls will have to be made — but these free many of the resources you’ll need to move forward. Box 3 – Look for “weak signals that could transform your industry.” These may involve changes in customer demographics, technology, distribution channels, potential competition and regulatory environment. Also look for clues in things that disrupted other industries. With this information in hand, begin making small bets, which allow for testing assumptions while hedging risk. Some bets will pay off financially; others won’t. Regardless of financial outcome, all bets provide if-then insight into making larger bets in the future. 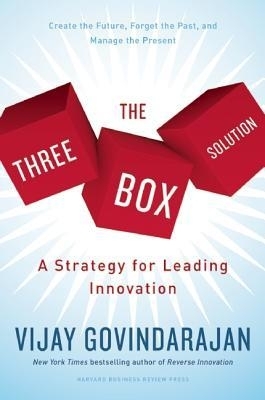 Govindarajan drew his three boxes from Hindu philosophy which believes that “creation-preservation-destruction is a continuous cycle without a beginning or an end.” By keeping the cycle in mind, the process of constantly questioning what should be in each box becomes ingrained in an organization’s culture. Most people believe negotiating pits one side against another. As adversaries, the parties try to “win” because winning provides a measuring stick for success. When deadlocked, no one wins and each blames the other for the impasse to save face. Malhotra sees negotiation from a different perspective — the human-interaction view. It’s the way people work as partners to resolve their differences relating to a common issue. The “we’re partners” approach begins with properly framing the issue. 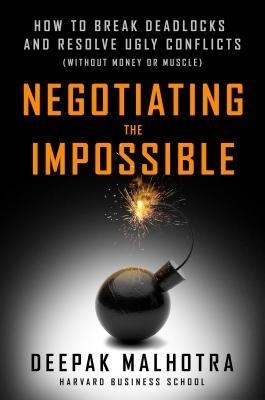 “The frame that takes hold will shape how negotiators make decisions, evaluate options and decide what is acceptable.” The message: Control the initial frame and you’ll control the process of the negotiation. Framing requires both homework and adaptability. The homework involves educated guessing about what the other party wants to accomplish. The adaptability involves how to appeal to the other. There are multiple ways/combinations of ways to frame the issue including: financial, strategic, short term, long term and terms of previous deals. If the other party has read this book, reframing may be required to create the process and/or resolve sticking points. The process should always focus one “forward momentum.” What’s that? It’s “the deliberate, gradual process toward eliminating obstacles and creating the conditions that might eventually lead to a successful outcome.” Note Malhotra’s use of “gradual”; he believes a low bar for progress on individual elements, while lengthening the process, leads to a high probability of achieving a ‘problem-solved’ final agreement.